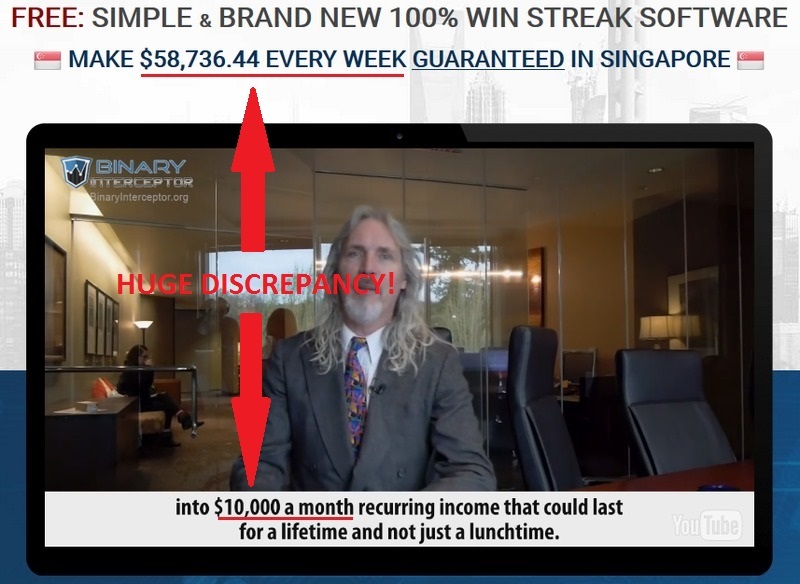 Binary Interceptor Review - It's a Scam! Binary Interceptor found at binaryinterceptor.org promises to make you $10,000 a month without working, but don’t be fooled. Binary Interceptor is a scam! We’ve done the investigations, so read our Binary Interceptor review before you commit yourself to a financial headache! Binary Interceptor is a scam! As soon as you enter the homepage of Binary Interceptor scam, you’ll be greeted with a big headline that reads “FREE: SIMPLE & BRAND NEW 100% WIN STREAK SOFTWARE”. Is Binary Interceptor really free and gives you 100% win streak? Of course not, it’s just a headline to grab your attention and make you watch the sales video! The sales video is there to brainwash you into signing up for the scam. However, did you notice a huge discrepancy in the profits promised by the headline versus the one promised by Robert Harper in the sales video? In the headline, you were promised $58,736.44 A WEEK instead of $10,000 A MONTH as quoted by Robert in the sales video. This discrepancy is a huge red flag that you should take note of. Apparently, the profits promised in both statements are fake, as they are just randomly generated numbers used to get our attention and to trap victims. If you provided your email address and got into the members area, you’ll be presented with a few featured members and their “live results”. Most daily profits shown are in the thousands of dollars, averaging around $2,000 per day. Unfortunately, none of the members nor profits shown are real. We decided to do a reverse look up based on the profile pictures provided, and we managed to locate the original owners of the photos. The featured member, Beth Duncan (as shown above) was actually Elisa Toune, where Binary Interceptor scam stole her picture from Twitter and fabricate a profile based on this picture. 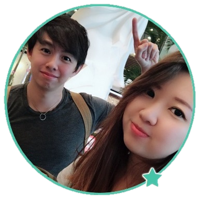 To give you more assurance, we have uncovered another stolen picture from Binary Interceptor featured members. 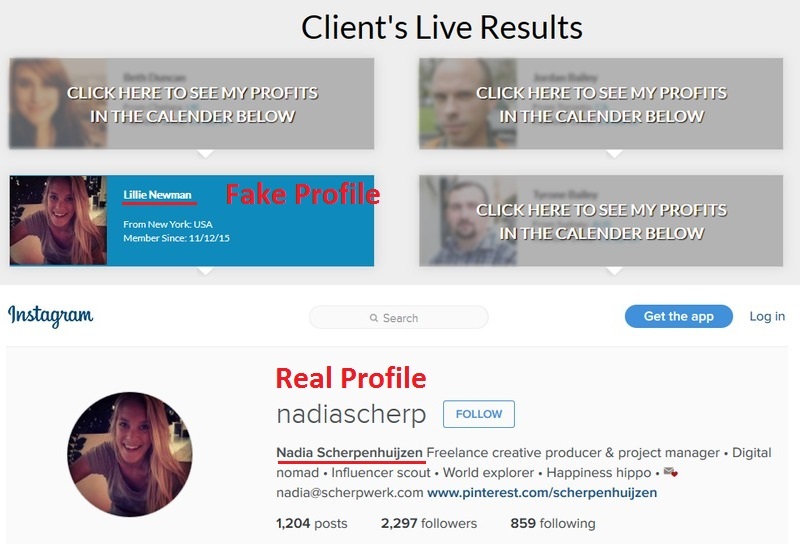 Lillie Newman, the member featured above was actually Nadia Scherpenhuijzen, and the photo was stolen from her Instagram. These individuals are not related to Binary Interceptor scam, and the scammers are betting that most victims wouldn’t find out the truth. Unfortunately, they are right. Majority of the scam victims would’ve believed the members and their profits are real. If Binary Interceptor scam really works as advertised, why do they feel the need to steal photos, fabricate member profiles and display unverified profits? The truth is, Binary Interceptor does not work, all the scammers are after is your hard-earned money. You must open a new trading account for Binary Interceptor scam! 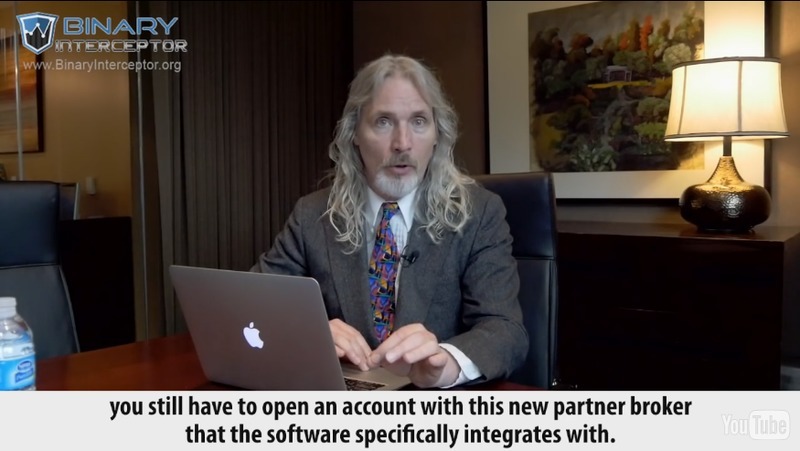 If you decide to sign up for the scam, you’ll notice that Robert Harper insists that you must open a new broker account, no matter what. This applies even if you already have an existing account with their partner broker. For example, if you already have a trading account with Binary Book broker, and you are assigned to the same broker, you’ll still have to open another trading account with a separate email address. Why can’t Binary Interceptor just integrate with your existing broker account? This is because the scammers behind Binary Interceptor makes money off the referral fees when you deposit at least $250 into the new trading account. When you open a new trading account AND deposit money into it using their webpage, they’ll be given referral fees by the broker itself. This is also the reason why Robert insists that you pick up the call of “startup specialist”, who is in fact a sales manager from the assigned broker to make sure you deposit fund into your new account. YES, BINARY INTERCEPTOR IS A SCAM. We strongly advise you to stay away from the scam if you don’t want to lose your hard-earned money. 98Success Review – 98 Success is a Scam!